The Kusovnik program is designed for engineering. Allows you to register, edit, print, and export bill of material (BOM). Program control is aimed at maximum simplicity and clarity. The architecture of the program uses a three-layer structure - the client, the application server, and the database server. The Kusovnik consists of a client, an application server, and a database server. The user connects to the application server with the client application and creates or modifies the position. The system allows the simultaneous work of several clients to record changes. SQL database MySQL or SQLite is used to store the data, MSSQL and Firebird are planned for the future. 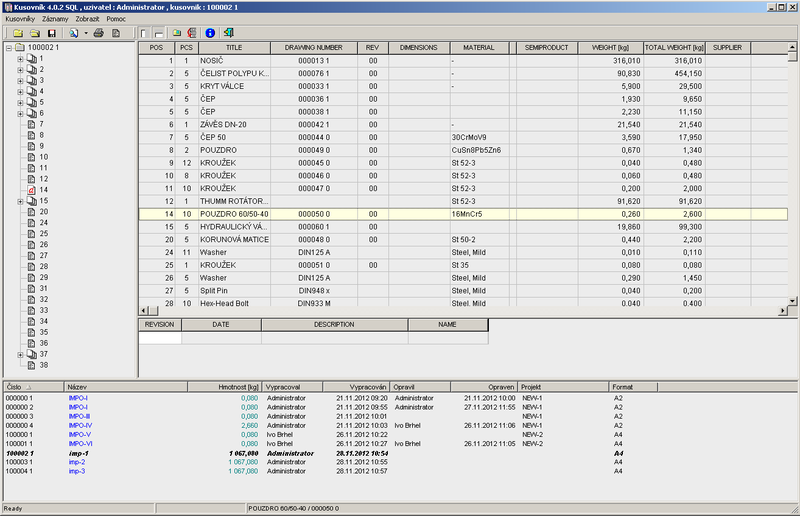 Importing data from Inventor is done using unicode csv files. The plan also includes a web browser as a thin client for access to BOMs.